Fix iTunes Cannot Restore Backup to iPhone 8 (Plus)/X (iOS 12 Included)? How to Fix iTunes Cannot Restore Backup to iPhone 8/8 Plus/X (iOS 12 Supported)? "I didn't have any problems updating my iPhone 6 to the new OS but when I got a new iPhone 7 on iOS 11.3 and tried to restore the data from the iPhone 6 to it, I keep getting an error message. I was forced to restore to an older iTunes backup and therefore I have lost a month's worth of data. Is anyone else having this issue and can anyone help?" The above-described scenario is not an isolated case. It is so common to experience numerous iTunes error codes when trying to update or restore a device that Apple list some of these errors. In this article, we are going to be looking at some of the common issues that can cause error codes in iTunes and how to overcome them. We will also go a step further and provide you with a more effective way to restore your device with iOS 12/11.4/11.3 or other older versions from an iTunes backup. Before diving into more invasive solutions, begin by checking the USB cable you are using to connect the device to the computer. The cable can be a problem even if the device is well connected and iTunes recognizes the device. So, if you are experiencing issues, use a different cable to see if connectivity is the issue. It is also quite possible that you are experiencing issues because the version of iTunes you are using is not up to date. You can check by going to About > Check for Updates. If you don't have the latest version, take a moment to install the latest version and the problem should go away. It is also likely that there is a "corrupt backup" causing all the issues you are experiencing. In this case, deleting the backup could fix the problem. The following is a step by step process too show you how to do it. Step 2: On Windows; Click Start and type %appdata% in the search bar. 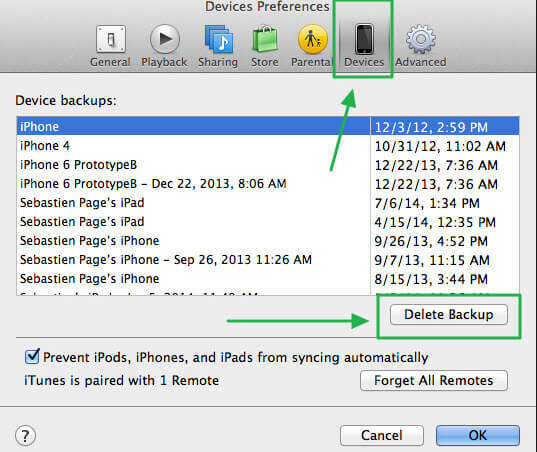 Navigate to Roaming > Apple Computer > MobileSync > Backup and copy the backup folder to your desktop. On Mac; Open the Library Folder in the Home Folder (Hold down Option and Click "Go" if you don't see one). Navigate to "Application Support > MobileSync > Backup and copy the backup folder to your desktop. Step 1: Now Open iTunes and click "Edit > Preferences" for Windows and "iTunes > Preferences" for Mac. Step 2: Click on "Devices" and then "Select All". Step 3: Click "Delete Backup". Step 4: Now move back the Backup folder in your desktop to the Backup folder and then restart iTunes and try the restore again. If all else fail, you can try a different but highly effective backup and restore solution to restore the backup to your iPhone. This tool is iMyFone iTransor (renamed from D-Port Pro) and it affords you more control over your backup and restore processes as compared to iTunes. The following are just some of the features that make it the best. 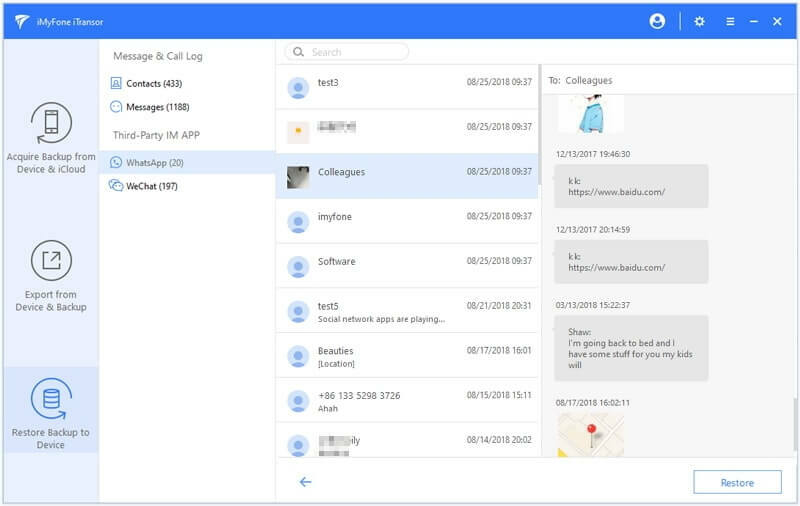 With it, you can choose to restore messages, contacts, WhatsApp, WeChat from backup without overwriting the other data on the device. 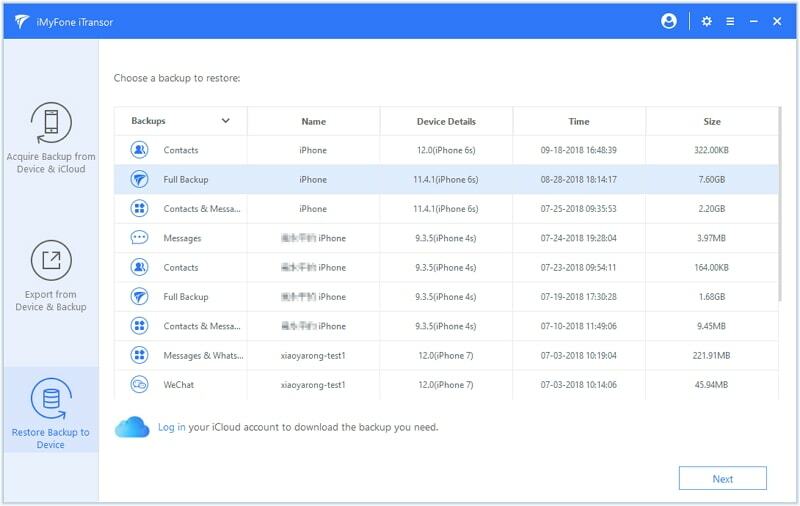 You can backup only messages, contacts, WhatsApp, WeChat data or make a full backup of your iPhone. 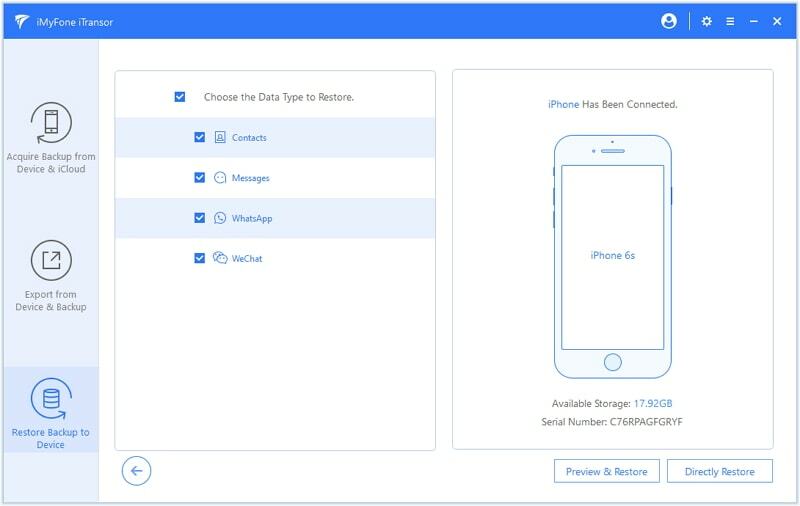 Export data from your device, an iTunes backup or an iCloud backup to computer easily. Download and install iTransor to your computer and launch it. 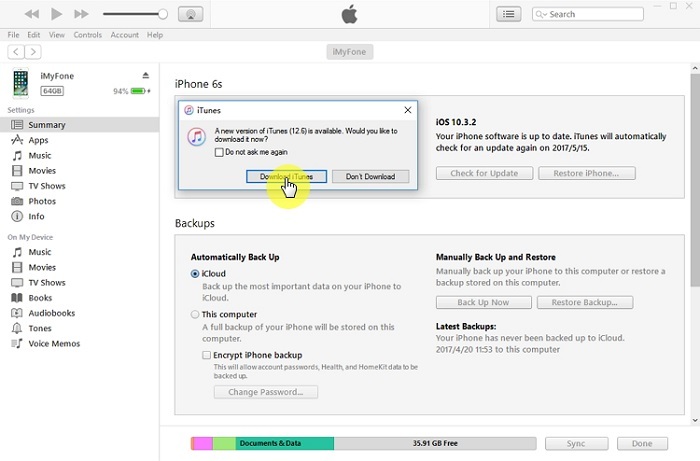 Then follow these simple steps to use it to restore an iTunes backup to your iPhone. Step 1: From the main window, choose "Restore Backup to Device". You need choose one backup from the list showed to you. 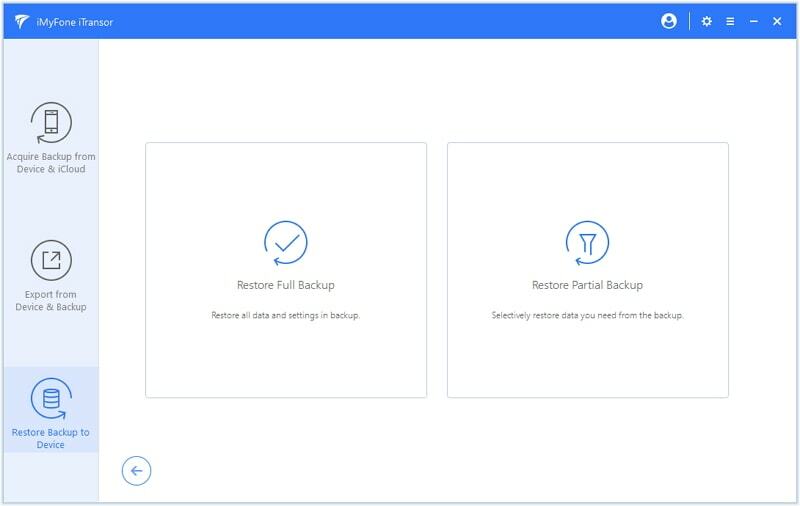 Then you can choose to restore a full backup or restore selectvely. Here we will show you how to restore your iTunes backup selectively. Step 2: Choose the data type you want to restore. Connect the device if you haven't already. Now choose "Preview & Restore" or "Directly Restore" to proceed. Step 3: If you choose preview before restoring, you will go to this stage; if you choose directly restore, just ignore this step. Step 4: Now you should select from "Merge" or "Replace" to restore. 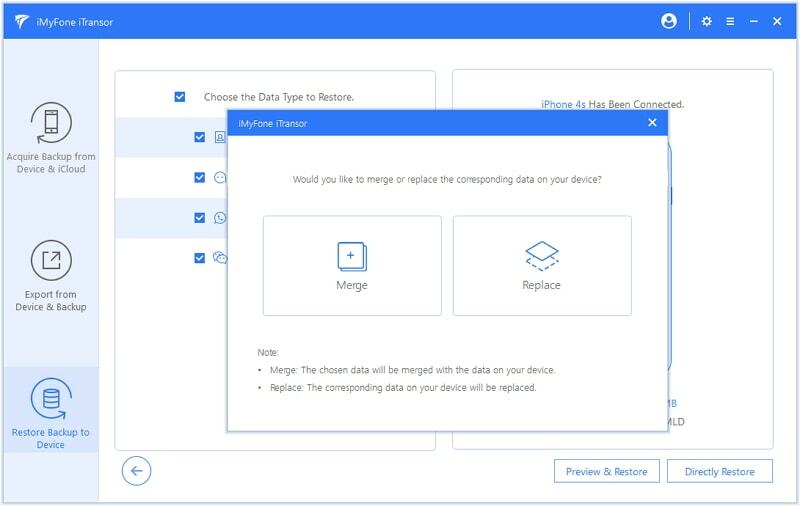 Merge will not overwrite your current data on your device. Replace means the corresponding data on your device will be overwritten by the specific data type in backup. Step 5: Now wait for the restore process to complete. You can view the restored data on your device after this process finishes.